I travelled by public transport from Ipswich to the Sainsbury Centre for Visual Arts to see their latest exhibition ‘Reality: Modern & Contemporary British Painting’. It was surprisingly easy and cheap to get there. The purpose-built modern building stands at the back of the University of East Anglia’s large campus. Outside the gallery the banner boasted works by Lucien Freud, David Hockney, Paula Rego, Walter Sickert and Chantal Joffe. Yes, ish. There was one Hockney, one Freud, one Sickert–you get the picture, but nevertheless a top-notch exhibition for a small city like Norwich. About fifty pictures in all hung in rooms separated by corridors. There was a landscape by Lowry and, missing any match-stick figures, I guessed it was his from the characteristic sky. The painting I liked the best was ‘Dirty King’ by Ken Currie. It had been lent to the exhibition by Flowers Gallery. 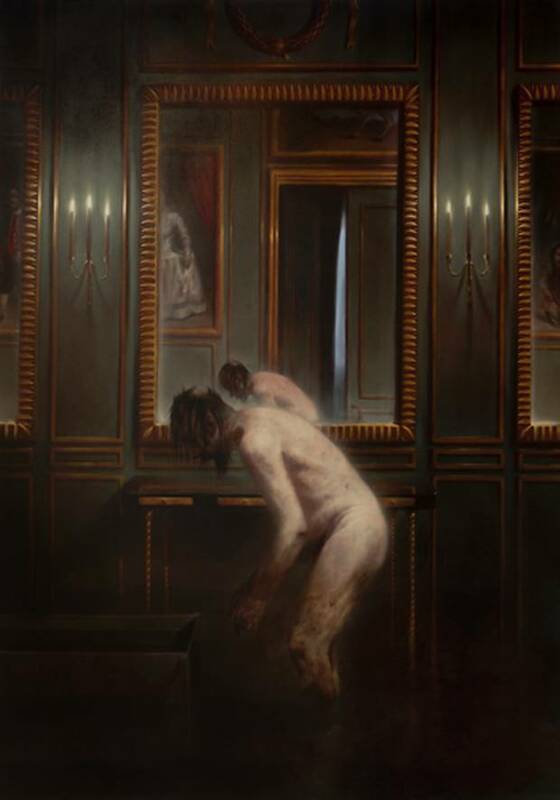 Ken Currie’s work is usually dark and full of tortured bodies and torturers, which in the light of the atrocities inflicted by Islamic State terrorists, I just can’t cope with. It’s too painful. But ‘Dirty King’ is different. Here an older man with scruffy hair and a large belly stands bent over in a regal apartment which appears to have flooded. His naked body is white and pink with softened edges contrasting with the hard-edged realism of the interior, emphasising his humanity and vulnerability. Upstairs Sainsbury’s permanent collection was primarily statues and statuettes from every ancient civilisation in the world. A small wax figurine from Egypt had survived four thousand years: how I longed to know the story of who found it, and where. There were Giacometti statues and drawings, paintings by Francis Bacon and Modigliani and three amazing mixed media sculptures of men by John Davies. You have to go and see them.